"We have not found anything that is equal to your merit"
This from a letter written in 1501 by Isabella d’Este, Marchioness of Mantua, to Pier Jocopo Alari Bonacolsi (circa 1455-1528) known as Antico. The exhibition "Antico: The Golden Age of Renaissance Bronzes" is a joint effort of The National Gallery in Washington D.C. and the Frick Collection in New York. The collaborating curators were Eleonora Luciano of the National Gallery, Denise Allen of The Frick and Claudia Kryza-Gersch at the Kunst Kammer of the Kunsthistorisches Museum in Vienna. The latter lent several of the treasures to the show. The show boasts 39 examples about three quarters of Antico’s known bronzes and what fabulous examples they are. Antico was obviously not very prolific, though I am sure that we have either not yet found or identified others. When I arrived at the Frick on a Sunday morning the line was already over a block long. I spoke to the guard outside and was told I could get in right away with a membership card and that everyone waiting outside was most probably there to see the large Renoirs that were on view since it was the last day of the exhibition. While I breathed a sigh of relief that the Antico exhibition would not be mobbed I was also a little sorry for all those people who did not realize what a great treat they were missing. Antico worked for three generations of the Gonzaga family, the rulers of Mantua, creating medals and sculptures after the antique to fit in with the great collections from antiquity that they had already acquired. The medals were often portraits of the patron with allusions to mythology on the reverse. The bronzes were also modeled on the sculptures that were being excavated during the last quarter of the 15th century and first quarter of the 16th in and around Rome. All the sculptors of the period studied and emulated these works of art in an effort to bring back the beauty and perfection of the past. They also added their contemporary techniques. Hardly anything is known about Antico’s early life but it is supposed that he originally apprenticed himself to a goldsmith. This makes perfect sense when you view the smooth and beautiful lines of his bronzes, especially those partially gilded and/or with silvered eyes. 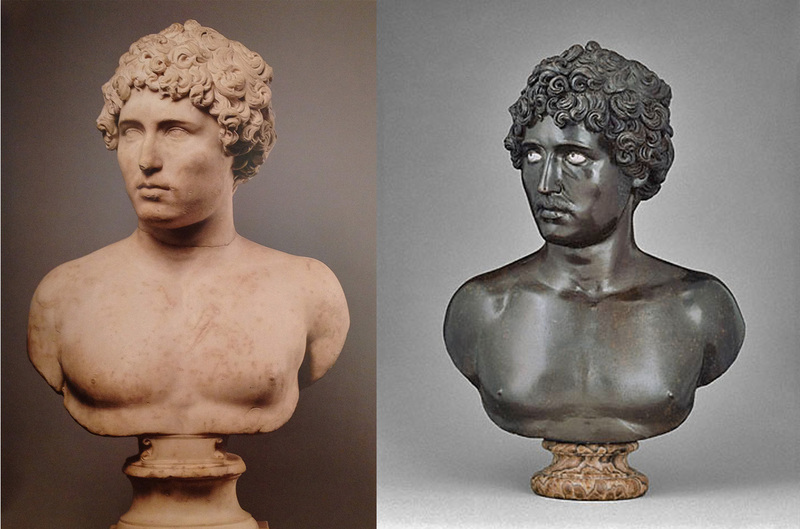 The show commences with an antique marble portrait of 140-150 AD lent by the Hispanic Society and opposite it a fabulous large bronze head with silvered eyes by Antico lent by the Getty. Needless to say the former had known better days and was not exactly in pristine condition while the Getty bronze could have been made yesterday. As you know, I always try to pick a work of art that I would like to take home with me. I only get to choose one! I found this particularly difficult because there are several that I love. Possibly because of my background in French 18th century works of art, I love the gilding and silvered eyes we find on much of Antico’s work. 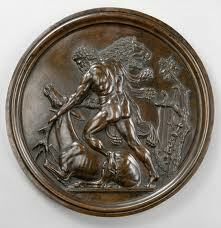 To my own surprise the piece that ended up in first place was one of the large roundels of the Labors of Hercules, this one representing Hercules and the Ceryneian Hind lent by the Kunsthistoriches Museum. For me part of the attraction is the subject matter that is so unusual and original. Well, not exactly original since it is based on a Roman bronze provincial coin of Septimius Severus with variations. Here I run into one of my perennial problems, an image never does justice to a work of art. If I illustrated a bronze with gilding it would literally shine but the gallery lighting is not the same as that used for photography and when we see the object directly with our own eyes we interpret it differently. I hope that now, with the large Renoir canvases returned to their respective homes, visitors to the Frick will discover the rare gathering of the exquisite works of Antico. To my mind Isabella d’Este’s assessment of his talent was right on.